It is said that visits always give pleasure – if not the arrival, the departure. In my case, visiting Nigeria over the past month gave me much pleasure, not only in the arrival but my entire stay in that fascinating West African Nation. The sense of community, direction and focus in carrying out the great commission was extraordinary among the leaders I interacted with. I was privileged to meet with key AEA stakeholders in Ilorin and the central Nigerian city of Jos Nigeria, specifically leaders of the Nigeria Evangelical Fellowship in both cities. The current era is exciting moment for the church in Africa. The evangelical church in Africa needs a strong and vibrant representation and we pray that you join in the effort towards a sustainable representative voice in a more viable, visible and vibrant Association of Evangelicals in Africa (AEA). 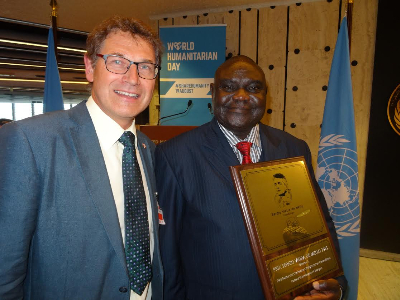 From the depths of turmoil and chaos to being awarded the prestigious Sergio Vieira de Mello Prize for their historical national and international influence to promote peace in the Central African Republic (CAR). This journey tells a tale of struggle, seemingly insurmountable challenges, an unerring determination to make a difference and most importantly, precedence towards serving others over personal safety and security. 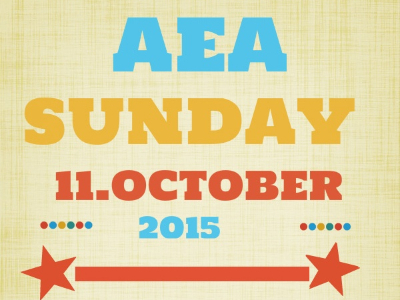 The AEA President, Dr. Goodwill Shana and his wife, Apostle M.B Shana, celebrated 25 years of Ministry in Bulawayo from the 6th to the 9thof August, 2015. 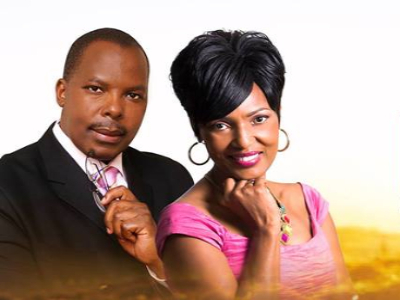 Word of Life International Ministries (WOLIM) was founded by Dr. Shana and Apostle M B Shana in 1990 and have served over the past 25 years as pastors. 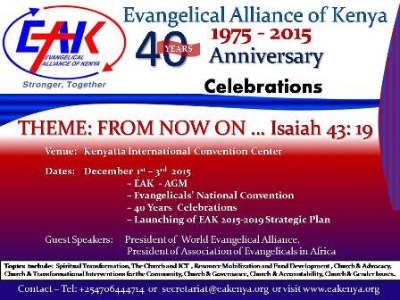 The Evangelical Alliance of Kenya (EAK) will hold anniversary celebrations from December 1st - 3rd, 2015 at the Kenyatta International Convention Centre (KICC), in Nairobi, Kenya. The convention is also geared towards spurring each other to spiritual growth and challenging evangelicals unto good works and being relevant in the society, and keeping focus on disciple-making in the market place.